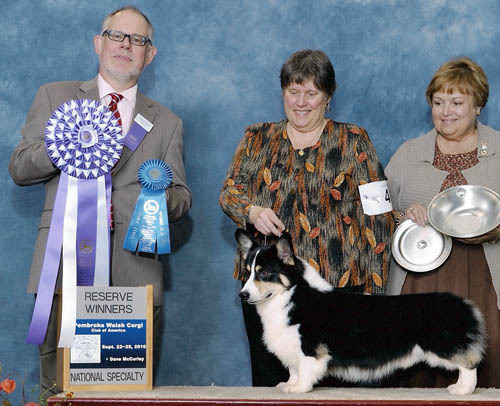 VACHE has formed a partnership with two long-time friends, Stephanie Hedgepath of Jimanie Pembroke Welsh Corgis and Linda Stoddard of Woodwynne Pembroke Welsh Corgis. We have decided to use TRIFECTA when we breed a litter in partnership. We thought it sounded better than JVW! Hi There! Welcome to Vache (rhymes with wash) Pembroke Welsh Corgis, owned by Doug and Denise Scott. Vache is French for cow and since Denise has a collection of black and white cows and, as Corgis were used to drive cattle, (O.K., we know they were probably used on the black Welsh Cattle, but we like black and white ones!!) it was only natural to combine the two. We hope you visit often so that we can keep you updated on happenings here at Vache. We are a small breeding kennel and plan approximately one litter per year.